Our Abpromise guarantee covers the use of ab172182 in the following tested applications. Expressed in many tissues, highest levels in skeletal muscle. Defects in RPS6KA3 are the cause of Coffin-Lowry syndrome (CLS) [MIM:303600]; an X-linked dominant disorder characterized by severe mental retardation with facial and digital dysmorphisms, and progressive skeletal deformations. Autophosphorylated on Ser-386, as part of the activation process. Ser-227 phosphorylation promotes Ser-386 phosphorylation and leads to basal activation. Full activation by growth factors requires additional phosphorylation on Ser-369. 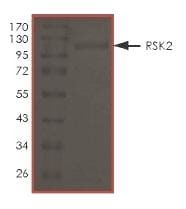 Sample Kinase Activity Plot. ab172182 specific activity was determined to be 140 nmol/min/mg. ab172182 has not yet been referenced specifically in any publications. Publishing research using ab172182? Please let us know so that we can cite the reference in this datasheet. There are currently no Customer reviews or Questions for ab172182.